Damp, humidity and mould within homes are experienced by everyone to some degree and it can be infuriating trying to find the cause and then how to actually resolve the problem. The new £249 Meaco DD8L Zambezi desiccant dehumidifier is particularly interesting because it claims to be the best domestic dehumidifier in the world - for apartments to small five bedroomed homes. You can’t get a stronger claim and we’ve been using it in an environment where the lower interior walls suffer from discoloration to see if it’s the correct remedy. White is a fairly flexible colour for this appliance's square plastic body. We’ve had ours set up in a country cottage-style living room and a modernist contemporary studio - where it blended well into the diversity of surroundings. In fact, the 548mm x 358mm x 200mm design can be hidden, given consideration; and we managed to achieve this by placing the DD8L Zambezi dehumidifier behind a chest of drawers and out of eye-line. When getting up-close with this dehumidifier it is evident it’s well thought out. The top handle is secure and makes moving the 7.8kg mass to a new location hassle-free. Furthermore, the motorised top louvre closes when finished to prevent dust from collecting, and the lower removable 3L anti-mould coated water container has a lid so you don’t spill liquid on your quest to find the nearest sink. The cherry on the cake would have been a retractable cable. You may wonder why there's an elephant etched on top. This is because a £2 donation goes to the David Shepherd Foundation, to help conserve elephants in Zambia. We highly approve! One of the reasons Meaco are loading such high acclaim on this dehumidifier is because it’s loaded with options and functions. It can be set to dry laundry or enable ionising, it has a target humidity level functionality changeable in 5% increments, has two independent inbuilt timers, a clock, 3 fan speeds, a turn-me-on functionality to alert the user of high humidity and the louvre can be programmed to remain static or fan in multiple manners. Additionally the user interface is quick to cycle through on the backlit digital display via the arrow keys. It takes very little time to accustom yourself. When turned on the Meaco does indeed remember the previous session and all configurations of settings. 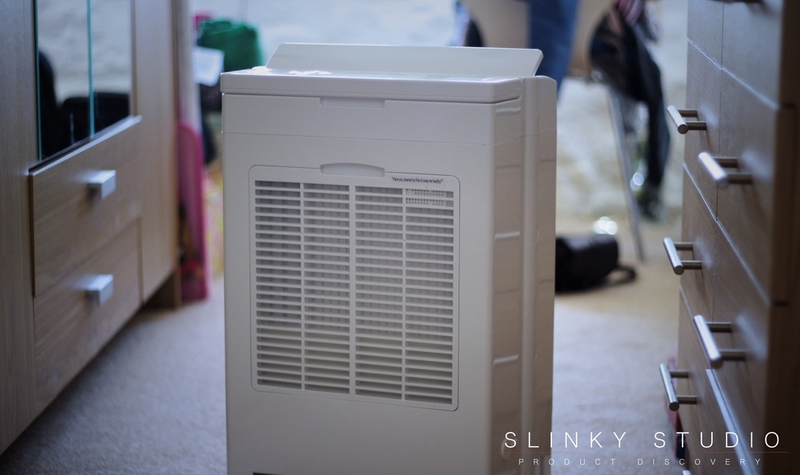 This is a desiccant dehumidifier, meaning it can operate in temperatures from 0°C-35°C, whereas the compressor type can’t operate below 5ºC and are hugely ineffective under 15°C by comparison. We tested the Meaco DD8L Zambezi dehumidifier within an older granite styled building which could dip below 15°C - such buildings can be notorious for clammy atmospheres and general moisture issues. In our circumstances we guessed the climate's moisture was either passing through the ‘brilliant white’ painted granite walls or it was an internal problem leading to discoloration of the lower walls. Upon first turning on and leaving to run for 4 hours on a target 55% humidity at fan speed 3, we were surprised on collecting 1 litre of water. Within a week the discoloration was effectively halved in appearance by the Meaco set at the above configuration - collecting a consistent 600ml of water in every cycle. The paintwork felt a bit rough but was dry. After three weeks of identical usage for 2-3 hours a day, 2-3 times a week, the discoloration was nearly expelled entirely and we hope the ioniser will help with the mould spores. It still needs a touch-up with paint, but the clear indication is that this dehumidifier is the solution. As a further experiment we abruptly stopped using the Meaco for three weeks to see if this was an issue that was a constant. So far all signs are pointing to a condensation problem magnified in the winter months which has led to black mould on the walls from internal absorption of water. Now we operate the Meaco in close proximity to the walls once a week for just two hours and so far things are looking good! Proof in how effective the Meaco DD8L Zambezi dehumidifier is in drawing the liquid from all angles, was visible by its clearing window condensation in no time and also marginally shrinking a wooden floor in a bedroom it was situated in. It quite literally drew the moisture from the floor boards and also removed from the atmosphere that muggy feel after waking up in the morning. Heavy sleepers will probably have no issue with the 41-50dB maximum from 1 metre noise output whilst they’re in the land of nod, however we noticed that the dry atmosphere outputted could make you feel dehydrated and irritable. This is lessened if we set a higher target humidity level, but we don’t need it running all day anyway. In this respect it is interesting to read about the cost of powering the Meaco DD8L Zambezii per hour at the full 656W, collecting a theoretical 8.3 litres/day: it works out at 10.03p/hour based on 15.2p/kWh. On fan speed 1 collecting 3.9 litres/day this would work out at 5.32p/hour. The user interface is straight to the point and importantly takes care of regular use all by itself. The ioniser, variable fan speeds, target humidity functionality, timers, etc., make the Meaco DD8L Zambezi extremely versatile, and most importantly it works in cold and warm climates, always having a noticeable impact on air quality and the overall feel of the atmosphere. We definitely recommend this for large open-plan spaces where issues with damp and humidity are present.